When a couple prays together, it’s amazing what God will do for them, and within each of them. It binds you together as a “cord of three strands” —with you, your spouse and God, united as a team. who aren’t very good at this prayer thing. to talk to You aloud together. So we ask You: Please teach us to pray! Help us to open our hearts to You and each other. Give us grace to be honest and transparent. Dissolve our fears and insecurities with Your love. and onto You when we pray. so we’ll be praying in Your will. like eating, breathing, and talking. When Charlie Shedd, beloved Christian author and his wife, Martha, were a newly married couple —one of the first lessons they learned was that there are some things you just can’t express in words. Charlie was studying to be a pastor, and he knew how important prayer and God’s word were for the spiritual bonding he and his young wife desired. But in their first times of prayer together, Martha said that she was afraid that what she said to God would embarrass Charlie. Charlie understood why she might feel that way. As a seminary student, he was articulate, whether speaking to a group or telling God his thoughts. He sensed that Martha was more than a little intimidated by his verbal skills. So instead of praying aloud, they decided to take a different approach —they began to ask each other about their biggest concerns, listen as each shared, and then pray about them together silently. Charlie might say, “I’m worried about where our money is going to come from.” Martha might add, “I’m worried about our child.” Charlie might admit, “I’m concerned that I’ve been difficult to live with lately.” Once they had expressed their concerns, they would hold hands and pray silently for the other person, and then pray the Lord’s Prayer together or read Psalm 23 aloud together. Real life gave this couple many opportunities to join together and pray —when they had a problem they couldn’t solve, whey they were angry with each other, when they faced financial stresses, or when Charlie wanted to go one direction and Martha wanted to go another. Another thing that helped their prayer life and brought a closer spiritual bond was their weekly drive. Almost every week, Charlie and Martha would leave the kids with their grandparents or a sitter for an hour or two so they could take a drive together. They’d take along a Bible, and the spouse who wasn’t driving would read aloud from a passage they were studying. Then they would talk, share prayer concerns, and pray silently. They found other ways to share God’s Word together. Sometimes they chose one verse of the bible as their verse for the day and “wrote it on their hearts” in the morning. That night before going to bed, they told each other what their verse was and what it meant to them. In forty-eight years of marriage they read through the Bible twenty-two times, discussing their questions and insights along the way. As the Shedds grew in their marriage and in Christ, Martha’s self-consciousness gradually melted away, and they were able to pray aloud together. Like all of us, at times they had needs that they didn’t know how to verbalize —so they would go back to praying together silently. But whether praying aloud or silently, they treasured their prayer times together and the “soul harmony” that resulted. Couples around them were so struck by the happiness in the Shedds’ marriage that they asked if Charlie and Martha could help them deal with their problems and develop better marriages. And so began their marriage ministry, which eventually blessed thousands and thousands of families around the world. The above thoughts came from the book, When Couples Pray -written by Cheri Fuller. Cheri is an inspirational speaker and the author of more than twenty-five books. She is a contributing editor for Today’s Christian Woman and writes regularly for Focus on the Family magazine. This book was published by Multnomah Publishers. Something that should inspire us from what Cheri says is: “The reality is that half of all marriages today end in divorce, both for Christians and non-Christians. Studies show that simply attending church does not guarantee a happy marriage or divorce-proof a relationship. However, couples who pray together regularly report enjoying the most satisfying marriages of all —and the divorce rate for praying couples is less than 1 percent!” This should give us all the more incentive to bond together as a family unit in prayer. 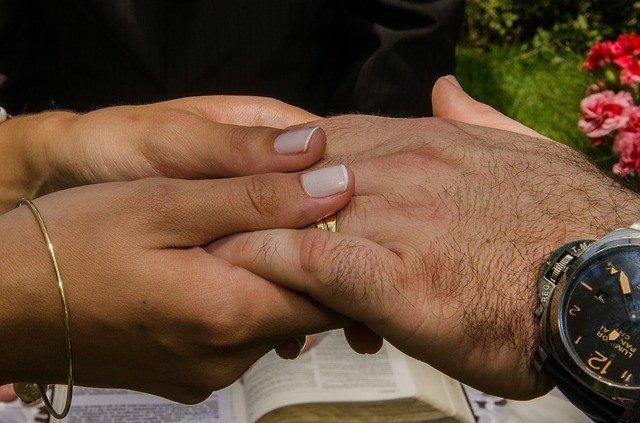 (USA) My husband is a pastor and I thought when we got married that we’d pray aloud together, but I’m always waiting for him to initiate it. When we do pray together, only he prays aloud. I feel self conscious praying aloud with him as he’s been a Christian much longer than I. I feel a deep sense of longing for us to pray aloud together which I can only assume is coming from God. Please pray for me that I’ll overcome whatever barrier is holding me back. (UNITED STATES) Trina, what is holding you back is Satan. He is trying to slowly creep into your marriage by making you feel like you are not on your husband’s level..you are a “woman of God!”…I was exactly where you are..my husband is a minister and when we prayed together (which isn’t often, sad to say) I felt what you felt, even though I was the first to initiate it. My hold back was that I could not read and understand the Bible..so I had to go and buy an NLV so I could understand the word for myself and when I did I couldn’t put that book down! I have started praying on my own. Search your heart and find out what is holding you back…what is making you feel inadequate. I felt like if I prayed my prayer was not going to sound like my husband..he did it just effortlessly and all the words sounded good and he “knew how to pray”..what I did not know is that I knew how to pray too, but it was after I sought the Lord for myself…not saying that you are not but iI am suggesting that you seek what is making you feel unconnected in this manner. Do not let Satan fool you…if you are feeling this way your husband is going to sense it if he has not already…then when you get God in your mind and heart…when the two of you fall down together…it will be because you initiated it too AND you had a prayer in your heart just like him and it will be a prayer that intercedes on behalf of YOU. There can be breakthroughs because of what you sent up for your family AND for those you come in contact with. DO NOT LET SATAN WIN in your prayer life…once he gets in through your prayer life, he will start on your family and marriage…I love you….and I pray that barrier comes down that is blocking you – in Jesus’ name ….amen. (GREENWOOD MS) I thought this was good. (U.S.A) I’ve been sinning and I got in trouble in school, but I’ve been praying. Do you think God will save me from getting into trouble by my mom?